"Ancilla" was a 57ft double-ended timber motor yacht, built in the early 1930s. Very elegant for the time, the story is that she served as the ceremonial yacht of the Lord Mayor of London at one time. She had a small rig on her to serve as steadying sails and this was converted to a small gaff rig about 1980. She deteriorated to become almost derelict and was finally replaced by a new steel yacht, the "Ancilla II". The above-water appearance of the hull of "Ancilla" in profile was retained because it was particularly pretty as drawn although the hull lost its shape over the years. I also attempted to pick up as much as possible of the image of "Ancilla" because that is what the owner fell in love with. At the same time I turned her into a boat which sails well. Although her appearance is very traditional, her interior is very modern in concept. This allows far better use of the available space than when "Ancilla I" was built. However, she must be fitted out in a traditional manner with traditional finishes and detailing to make a spectacular boat with good resale value. The upper part of the accommodation is a deck saloon rather than a pilothouse. It has a social area aft and working area forward. The seating area aft has a hinged table to allow for its use as either a dining or lounging area. With the island seat included, it can seat 9 for dining with a view. To starboard is a wet bar. Forward is the helm position with the nav centre to port and oilskin locker to starboard. The helm has a swivel chair and a swing out stool is used at the nav centre. Completing this area is the staircase down to the accommodation below, a duplication of the one in "Ancilla I". In the sole and cabintop are access panels for removal of the twin engines from the engine rooms below. Down below, there is a large and luxurious owners stateroom forward of the lazarette, with settee, dressing table, extensive lockers and its own heads with sitzbath. This is separated from the main accommodation by the engine rooms, one each side of the central corridor. Forward of the engine rooms is the main saloon. It includes an eight-seater dinette and fully fitted galley. Allowed for in the gally equipment are twin sinks, top loading freezer, under counter fridge, microwave and 3 or 4-plate cooker with oven. There is plenty of counter space for preparing gourmet meals in a charter situation while the U-shape gives security to the cook with the ability to escape quickly in the event of a flare-up or spill. Over the saloon and galley are two large skylight hatches. Each is in fact half of a traditional gabled skylight hatch, separated by a large deck storage box and oversized Dorade box to ventilate the saloon and forecabins. Forward of the saloon are three double cabins, two with double berths and one with single V-berths. This area is served by two heads compartments, each with basin and shower. For those who do not like a wet-heads the one can be made into a shower and the other into a dry heads. On deck, she has an outside steering position on top of the aft cabintop, with deck storage boxes as seats. Steering from this position is through a Whitlock mechanical system driving the skeg mounted partially balanced rudder. From the inside position she is steered with an hydraulic system. The rig is proportioned to give reasonable performance. Topmasts have been dispensed with in the interests of simplicity. The rig has been made taller to compensate and will have improved light weather performance as a result. Working canvas would be the jib and staysail (both roller furled) along with main and foremain. For lighter beating conditions a light genoa, set flying, will replace the two headsails. Reaching will be with a genniker, main and foremain or the foremain can be replaced by a large gollywobler. 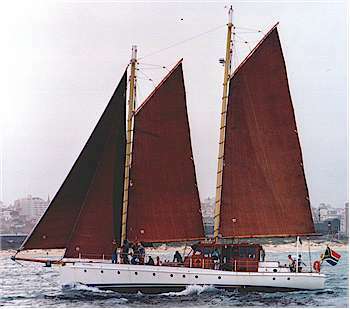 Schooners don't like running but an effective rig would use the genniker poled out by the foreboom on one side and the gollywobler poled out by the mainboom on the other. The hull is radiused chine in form, the first time that I have used this method for a double-ender. It has been successful, yielding a hull which will be easily driven for the displacement. Underwater, she has a long fin keel with separate skeg and rudder to improve manoeuvrability and windward performance. "Ancilla II" is a design for those with tradition in their hearts, but combined with a modern underbody for improved performance and handling. She is a robust cruising boat which will turn heads wherever she goes, particularly when seen in the sunset. Follow these links to the stability curve of this design, the list of drawings and an illustrated article on radius chine metal construction.